Catherine & Pierre Breton are makers of natural wines in Restigné near Bourgueil. 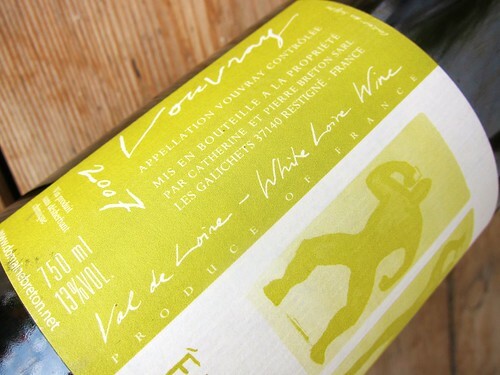 And many would even say that they feature among the spearhead of the growing natural winemakers group in the Loire Valley; their most famous representor certainly being Nicolas Joly (Founder of Renaissance des Appelations making the famous Coulée de Serrant wine). The Breton’s are certainly more known for their red Cabernet Franc wines, but they also own vineyards in the Vouvray area which is Chenin Blanc country. 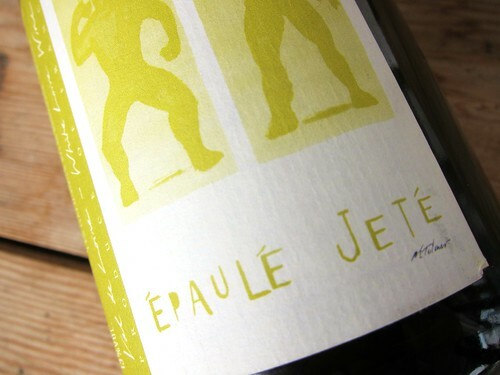 In Geneva I bought a bottle of their 2007 Vouvray “Épaulé Jeté” for about 20 CHF and waited for the first rays of sun to pop it open. Unfortunately it took more time than expected for the sun to show this year, but it was definitely worth waiting for this bottle. I don’t wanna lose too many words on descriptives. Also because I think this wine also is more about feel than perceived taste. Clearly there is some yellow fruit in there and maybe some hay in the nose, an impression of anise, but the wine is more about a general feel: gulpability, balance, presence. A certain fruit sweetness is very well absorbed by a hearty yet fine acidity. Minerality surges here and there. All elements of this wine are appealing on their own but happen to interact dynamicly like stormy waves in an ocean. This makes the wine simple in its beauty and exciting at the same time. Well, this is simply very enjoyable, and I wouldn’t have guessed it was from 2007 given the freshness of it. Great and interesting how a wine-estate finds its way into my life. I remember having had their La Dilettante (also Vouvray) in Terroir wine bar in London earlier this year but also -thanks to the search engine on my own blog :P – at Le Bô bar in Bordeaux last summer so I believe I am now more than ever an official fan of their wines. Does anyone out there have a secret tip on which of their reds I should try first?